The moment a child is born, a strong bond arises, but there’s one fundamental connection which is lost along the way. Before giving birth, the most important sound a child hears is the mother’s heartbeat. The calming nature of this ever-pounding rhythm is essential. 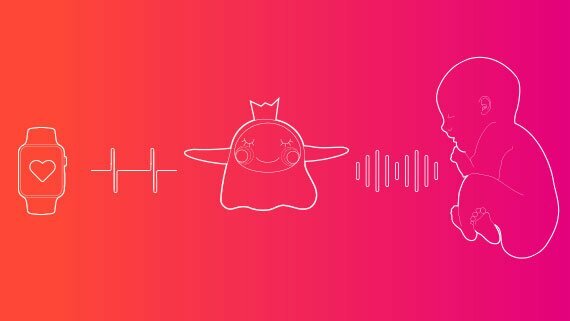 Telekom’s Shared Heartbeats app now broadcasts this sound to newborn babies with a simple synchronization. The app detects the mother’s heartbeat via the Apple Watch and links it to a Bluetooth speaker put next to the child to give them the reassuring they suddenly miss. This connection is an important aspect regarding the babies’ health. “The start of a child’s development can seriously affect the healthy development of the child and plays a crucial role in the prevention of psychosomatic disorders.” Dr. Anna Altman, Child Neurologist and Pediatrician claims. The app is already available in the App Store since April for smartphones and Apple Watches. It works with any kind of Bluetooth speaker, but on the website, special speakers can be ordered with custom-made skin design made by Manka (Monika Horvath), a Hungarian designer.